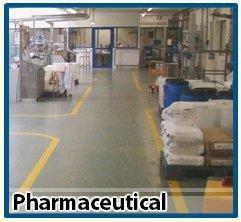 Pharmaceutical areas often use the most high-tech and cutting edge equipment and materials available. Since it is most commonly involved in the context of healthcare, pharmaceutical spaces demands the strictest sanitary environment where air purity is required. High Performance Solutions, Inc.(HPS) offers flooring products suitable for the cleanroom environment where sanitation is extremely prioritized. Our solutions provide anti-bacterial and static-control characteristics to ensure safe and hygienic surroundings.